For a limited time, with any purchase*, you will receive a FREE Silver Plated Chakra Pendant with 7 colored Rhinestones. This pendant is valued at over $50. 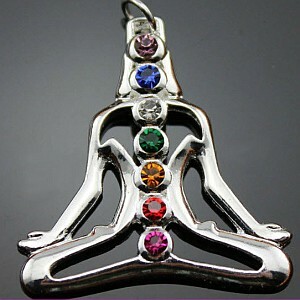 This pendant features a Chakra Buddha in a lotus position with 7 colored rhinestones at the major energy centers. This FREE GIFT promotion expires on February 28, 2014. You will practically glow with positive energy when you wear this chakra pendant. This gorgeous Buddha pendant is Silver Plated and features seven different colored stones designed in the body center of the Buddha to represent the seven chakras in the human body. 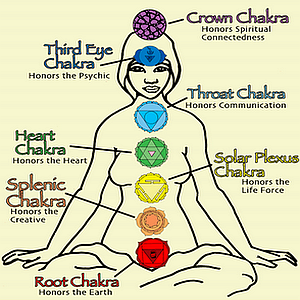 In Hindu and Buddhist beliefs, the chakras are believed to be the center pieces of each of the organs that gives humans energy. The chakras are energy gateways in our bodies, and when you wear this chakra pendant you will always have a positive energy. This stunning chakra pendant features various colored stones that represent the seven chakras in the human body. The silhouette cutout and polished finish give this chakra pendant a lightweight feel and striking appearance. Instructions: To receive this free gift, you need to make a purchase with the shopping cart, and you need to add it to your shopping cart by clicking on the 'add to cart' button on top of this page. 1. To get this free gift, you need to make a minimum purchase of $100. 2. Limit 1 free gift per each purchase with the shopping cart. 4. If we run out these specific pendants, we reserve the right to send it to you at a later time, or make a substitution of similar value. 6. The customer must add this free gift to the shopping cart by clicking the 'add to cart' button on top of this page. 7. If we ship your order during this promotion, we will include the free gift, even if you did not put it into the shopping cart.